Course Date: Sunday 7th of October 2018, 10am to 6pm. Venue: The Healing House in Dublin. 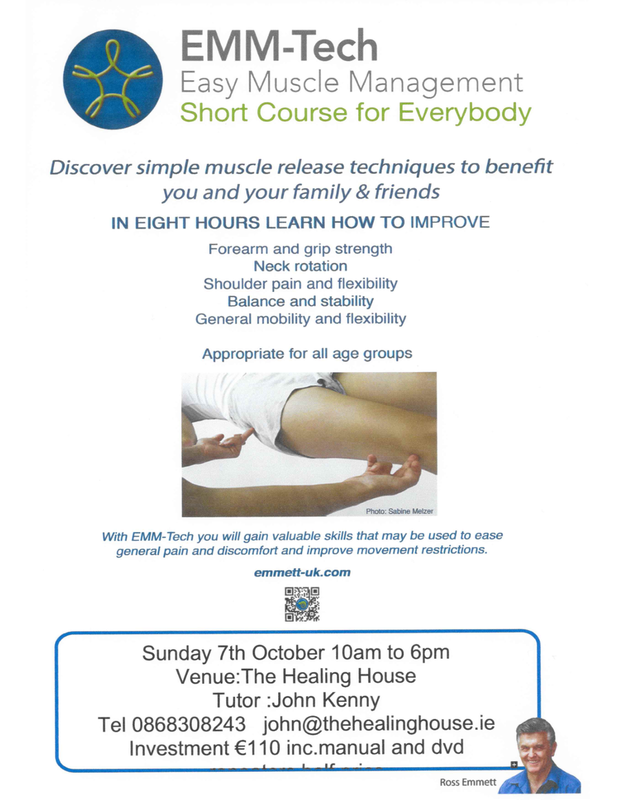 A short course in Easy Muscle Management. These moves are specially selected from the Emmett Technique professional course. Emmett is a system of body work devised by Ross Emmett, an extremely gifted and intuitive practitioner. Visit his Australian based website www.rossemmett.com.au or the UK site at www.emmett-uk.com for more information. The course will provide you with tools to simply and effectively release tension and tightness in 11 key muscles. Biceps 2 moves to release the shoulder when there is a restriction on lifting the arm. An excellent tool to help with frozen shoulder and with biceps strain. Diaphragm/Abdominal release – to open out the ribcage and help with breathing difficulties. Releases tight abdominal muscles and hunched over posture. Allows client to breathe more easily and deeply. The results from these moves are usually immediate – you will be able to see and feel the changes for yourself and after only a short demonstration and practice you will be able to achieve the same kind of results for yourself, your friends and family, or your own clients. 10 minute tea and biscuit break morning and afternoon. 30 minutes for lunch, bring a packed lunch. Your investment cost is €110 and it’s €55 for people who have completed the course and want to do it again.